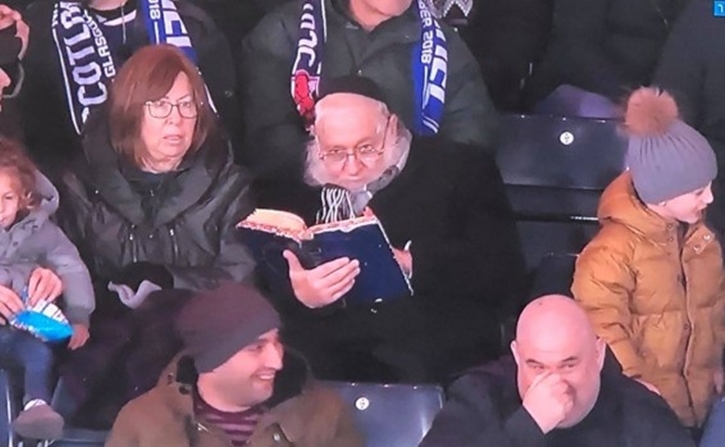 Glasgow, Scotland - A Charedi rabbi from Israel became an unlikely social media star yesterday when stadium cameras caught him studying Talmud during an important soccer match played yesterday in Glasgow. Rabbi Zev Leff had agreed to take his grandchildren to the game in Hampden Park that had Israel facing off against Scotland in the Nations League game, earning Scotland a spot in the Euro 2020 playoff. Israel had struck out early, taking a 1 - 0 lead against Scotland as reported by The Guardian (http://bit.ly/2A8qWFW), ultimately losing by a score of 3 – 2 in a nail biter that lasted nearly four hours. Cameras that panned across the stadium caught sight of Rabbi Leff, rabbi of Moshav Matisyahu, deeply immersed in his learning in the early part of the game as Israel enjoyed its brief lead over the home team. The camera lingered on Rabbi Leff for several seconds as he sat with his wife, daughter and several grandchildren looking up just briefly at the action on the field below, with announcers commenting on what was clearly unusual behavior at a highly anticipated sporting event. Son Shimon Leff told Israel Today (http://bit.ly/2AdCyY3) that this father was visiting his sister and brother in law, Yossi and Sara Bodenheim of Glasgow, who have been serving as Jewish chaplains at multiple local universities for the past six years. Leff said that his father had likely laughed when he heard that he had become a social media sensation. Leff said that he had already heard from numerous people who recognized his father in the viral video clip. Most had favorable comments although a few said that they were somewhat embarrassed, a reaction that Leff disagreed with. The Chabad emissary to Glasgow, Rabbi Mendy Jacobs, said that the match was big news for the local Jewish community, who cheered on both teams and took pride in seeing the Israeli flag and hearing Hatikvah, the Israeli national anthem. It was while Hatikvah was being played that another memorable moment unfolded, one that garnered over 400,000 views on social media. United Kingdom television broadcaster David Tanner posted video to Twitter showing Israeli team members sharing their jackets with the game’s ten child mascots, many of whom appeared chilled to the bone in their official soccer uniforms as they stood on the field in weather that had spectators bundled up in coats, hats and scarves. I remember my Father , A'H, taking me to Yankee games on chol hamoed pesach and sitting in the bleachers. My Father would spend the entire game looking into a sefer, no fame, fortune or viral clip. I'm sure he's getting his reward now though. I’m not so sure. With you’re username. Your a moron and a fool! Nice to see. Velts Goan and a Tzadik of a Jew. So he won't be invited to the Agudah convention. Nu nu. People who mix up "your" and "you're" TWO times in the same statement should not be calling other people morons or fools. Yeah he must be “real” proud of your screen name. You’re a disgrace. Rabbi Zev Leff is an amazing person and his talks so inspiring and his good heart shines thru. His shouting are available online for free download. The headline is garbled and misleading and should be rewritten. And your username makes you seem like a real brainiac.. lol. You’re an idiot. Your username is repulsive. It is wrong on so many levels. It takes a special kind rishus to trivialize the murder of 6 million yidden by flipping the word Nazi ay anybody you disagree with. Ugh.